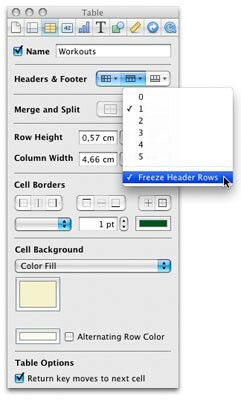 In my recent overview of the iWork ‘09, I mentioned the new Freeze Header feature in Numbers. This feature is basically the same as the Freeze Pane function in Microsoft Excel. It lets you set one or more rows or columns to always stay visible, even when scrolling around a large spreadsheet. Since I’ve been seeing some people searching the Web for information on how to use this new feature, I thought I’d post this quick tip here. The Freeze Pane function in Numbers ‘09 works a bit different than in Excel. In Numbers, you can only freeze header rows and columns. These headers are special in that Numbers knows that they’re not part of the actual data in a table, but rather sort of a “label” for the respective rows and columns. To define header rows and columns, open up the Inspector by selecting View → Show Inspector in the menu (or by pressing ⌘⌥I) and select the Table Inspector (third from the left). The second section from above is labeled Headers & Footer. Here you can select how many header rows or columns you want your table to have. And at the bottom of those menus, you can select if you want the headers to be frozen. Do Macs Need AntiVirus Protection Software?